A literal banner day for the Mets -- they raised their 2015 National League pennant before the game -- turned into a subdued 7-2 win over the Phillies on Friday when starting pitcher Jacob deGrom left due to a right lat injury. The afternoon was no more enjoyable for the Phillies, who fell to 0-4 for the first time in a decade. Before departing as a medical precaution, deGrom contributed six effective innings despite reduced velocity. The Mets, in turn, gave him a lead on sixth-inning RBI hits from Neil Walkerand Michael Conforto against Phillies starter Jerad Eickhoff. Walker singled home another run an inning later, and Conforto singled home two more. "It's a good start," Mets third baseman David Wright said. "Hopefully there's a lot more to come." The Mets' seventh-inning rally constituted a third bullpen meltdown in four games for the Phillies, whose 12.66 relief ERA ranks last in baseball. "We just need to get something going," Phillies manager Pete Mackanin said. "I need to keep everybody positive and not get down on themselves. Everybody is trying so hard." 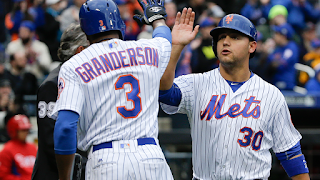 Triple-double: A troika of rapid-fire hits resulted in two runs in the sixth inning, giving the Mets the lead for good. Lucas Duda led off the inning with a double that Statcast™measured at 114.9 mph off the bat, his hardest-hit ball since the start of 2015. Walker followed with an RBI single, plating Duda, before Conforto sent Walker home on a double down the line. That spelled the end for Eickhoff, who had allowed merely two hits up to that point. Begging for offense: There are many reasons the Phillies are 0-4, but one of them is the offense. They have scored more than two runs just once in four games. They are hitting .120 (3-for-25) with runners in scoring position, and they did themselves no favors Friday whenCesar Hernandez forgot the infield fly rule, turning a potential rally into an inning-ending double play in the eighth. Can't keep it close: Eickhoff pitched relatively well, but the Phillies' bullpen cannot stop the bleeding. After Dalier Hinojosa and Daniel Stumpf worked out of a jam in the sixth, left-hander James Russell allowed four runs in the seventh to put the game out of reach. The Phillies' bullpen has allowed 15 earned runs in 10 2/3 innings this season. "We're going to continue to try to find out," said Mackanin, asked if he has the personnel in the bullpen to pitch effectively. "You shouldn't have to. In high school you should know that." Walker has driven in at least one run in all three of the Mets' games. He was responsible for five of the Mets' first eight RBIs this season. Ruf moving back to left field? Phillies outfielders are hitting a combined .116 (5-for-43) with one double, one home run and two RBIs, which is why Mackanin told Darin Ruf to begin taking fly balls in left field during batting practice. The Phillies pulled the plug on Ruf as an outfielder in Spring Training. "Although it's not according to plan, we need some bats with some power," Mackanin said. "I don't think that was even a thought," Ruf said of working out in left. "Now it is." Phillies: Phillies fans get their first look at hard-throwing right-hander Vincent Velasquez -- the key piece of the Ken Giles trade with Houston -- in Saturday night's game against the Mets at Citi Field. Velasquez threw the ball well in the spring, earning the No. 5 job in the rotation over left-hander Adam Morgan. Mets: Bartolo Colon will make his first start of the season on Saturday at 7:10 p.m. ET, looking to match Pedro Martinez for the second-most wins ever among Dominican-born pitchers. Colon recorded four outs in relief on Opening Night against the Royals, but has not pitched since.